Secrets of the Knights Templar is the compelling chronicle of the warrior monks and their fight to defend the Catholic faith, and of their participation in the efforts to vie for control of the Holy Land with the Muslim armies of Kurdish military genius Saladin and his successors. Informally organized in 1119 to protect pilgrims on their journeys to visit the Holy Land, and officially sanctioned by the Catholic Church in 1129, the medieval Knights Templar grew into an elite fighting force that played a central role in the battles of the Crusades. They were highly trained, well equipped, and unafraid to take up the sword to defend the church at the limits of western civilization. Though Templar was initially celebrated for their military acumen and acts of bravery, the once-celebrated order was eventually dismantled in disgrace, accused of political crimes as well as crimes against the faith. 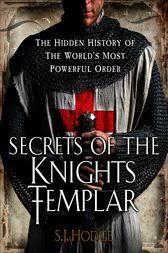 With its concise, authoritative, and accessible narrative--amplified by extensive citations from contemporary sources, and accompanied by generously captioned and stunning images of the period--Secrets of the Knights Templar brings a distant era of history dramatically and vividly to life. It is the perfect gift for anyone with a love of medieval, religious, or military history. Susie Hodge is the author of more than sixty illustrated nonfiction books, mainly on history and art-related subjects. Among her highly regarded works are Medieval Europe and The Forbidden City. She has also authored textbooks for the educational market, including Teaching History 11â? ?14 and Teaching History 14â??16. In addition, she writes for such prominent institutions as the Museum of London, the Victoria and Albert Museum, and the Royal Academy of Arts.